Introduction: Development of a viable natural orifice (NOTES) technique for inguinal herniorrhaphy (IH) has been primarily hindered by the inadequacy of available endoscopic instrumentation to effect peritoneal dissection and mesh fixation. 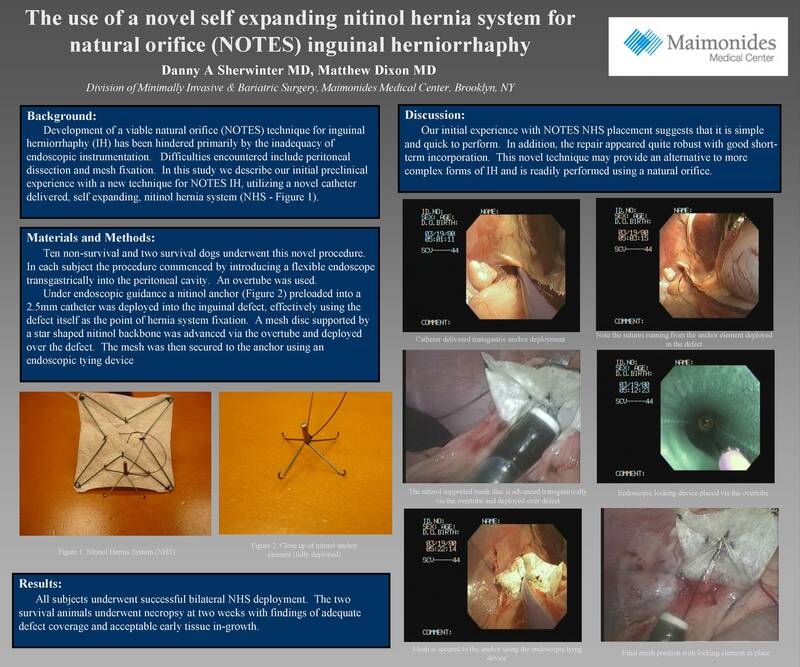 In this study we describe our initial preclinical experience with a new technique for NOTES IH utilizing a novel, catheter delivered, self expanding, nitinol hernia system (NHS). Methods: Ten non-survival and two survival dogs underwent this novel procedure. In each subject a flexible endoscope was introduced transgastrically into the peritoneal cavity. The NHS consists of a catheter delivered, self expanding nitinol anchor paired to a nitinol supported mesh disc. The anchor is first deployed into the inguinal defect and locked in place. The mesh is then secured to the anchor to complete the repair. Results: All subjects underwent successful bilateral NHS deployment. The two survival animals underwent necropsy at two weeks with findings of adequate defect coverage and acceptable early tissue in-growth. Discussion: Our initial experience with NOTES NHS placement suggests that it is simple and quick to perform. In addition, the repair appeared quite robust with good short term incorporation. This novel technique may provide an alternative to more complex forms of IH and is readily performed using a natural orifice.